Hey, I was young. I didn’t know any better! And the money was good. So, how could I turn it down? As a high school kid, you make money any way you can, even if it’s something you’re not thrilled about. That’s right, your boy Steve – a guy who once wrote an article explaining why Sugar is Worse than Jar Jar Binks – used to work for the enemy! 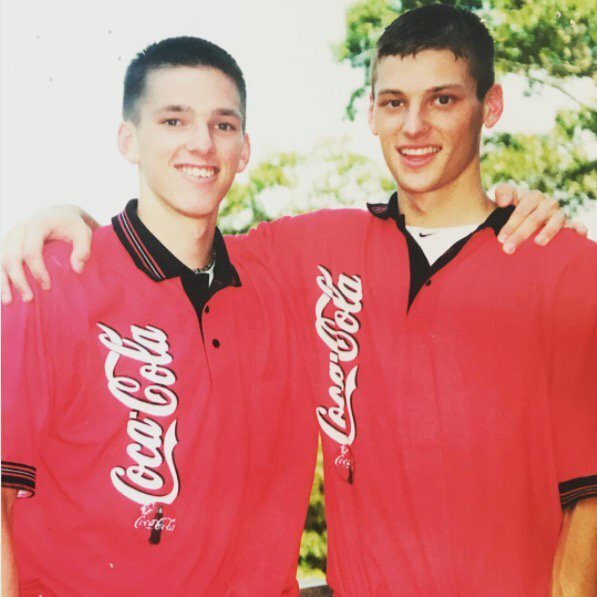 For two summers, my brother and I would wake up at 5AM, put on the sweet Coke polo shirts pictured above, hop into our Coca-Cola cars (old station wagons with Coca-Cola logos on the side), and stock shelves full of Coke products for 50-60+ hours a week on Cape Cod. Now, hopefully you know that the above “enemy” comment is in jest. If you happen to be currently employed by Coca-Cola or a company that sells products or services that are unhealthy, I don’t mean to pick on you or your employer…kind of. After all, Coca-Cola is a company that aims to make a profit by selling products that are delicious. I get it. Give me an ice-cold Mexican Coke made with real sugar in a glass bottle on a hot day, and it’s heaven. I also know they donate lots of money to charity, employ thousands, and do plenty of good things, and blah blah blah. 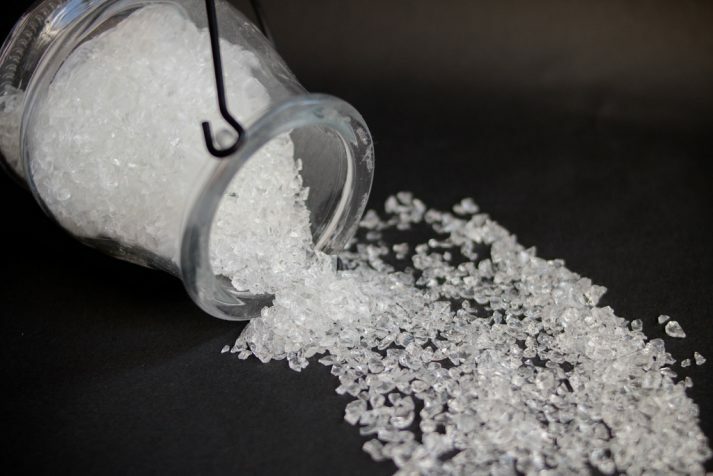 Twelve years after working indirectly for Big Sugar and seven years after starting Nerd Fitness, I now know just how detrimental sugar can be to our health, and it brings me to the point of today’s article! We know sugar is bad for us (right? I hope? ), but I wasn’t aware just how insidious this stuff has become in society and until I learned the history behind sugar’s rise in our day-to-day lives – and the rise in our obesity rates. The history of sugar is both fascinating and pretty messed up. 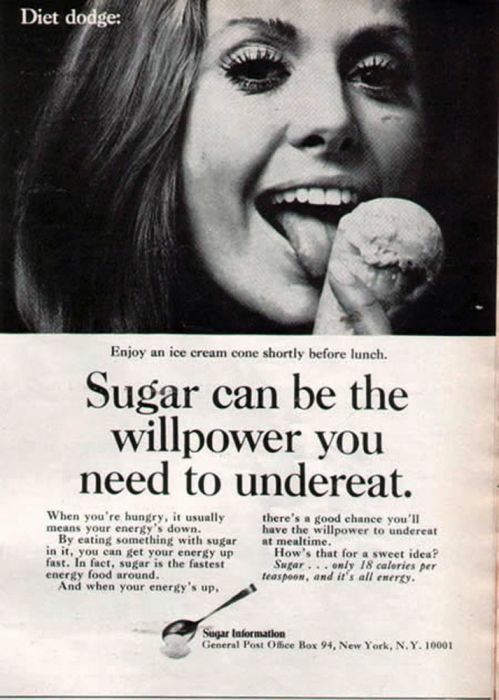 For starters, in the 1960’s the sugar industry actually paid scientists to downplay the connection between sugar and heart disease and instead promote saturated fat as the culprit. Screw facts and data; there’s money to be made! If you know anything about sugar, you can’t help but look at that ad and start laughing. “Use sugar to help you BUILD willpower? And NOT overeat.” Seriously!? Fortunately, these days we’re MUCH better off and way smarter, and silly tricks like that can’t work anymore. We know here at NF that you can’t outrun your fork (it’s one of our Rules of the Rebellion), and you can’t out-train a bad diet, so telling people to ONLY focus on exercising more without worrying about what you put in your bodies is horrible advice. Luckily, this group was shut down amidst widespread scrutiny and pressure by the public! Also, pesky things like “facts” and “experimentation” kept getting in the way. With all of the information coming out about how unhealthy soda can be in recent years, soda sales have steadily dropped to 30 year lows. This is AWESOME news, but don’t expect Coke and Pepsi to go quietly into the night. Like any animal or company that’s been cornered or attacked, they’re adapting and fighting to stay relevant. Thus, the strategy they’ve adopted is marketing “healthy” soda alternatives to find another pathway to connect their sugar water with our bloodstreams. If you’ve picked up a Vitamin Water, a Naked Juice: Green Machine, or a Smoothie King fruit smoothie lately, and patted yourself on the back for making the healthy choice, your head is in the right place…but your blood sugar level will say otherwise! At least when you drink a soda you know you’re making an unhealthy choice! Shame on these other companies for convincing you their products are pure and healthy when they often have as much or more sugar as a can of Coke. If you’re currently pissed off that you’ve been dutifully chugging Vitaminwater for the past few months instead of soda, assuming it’s healthier, I don’t blame you! The marketing and packaging leave you no choice BUT to assume it’s healthy and good for you. What’s as funny as it is depressing is that even Coca-Cola executives themselves know their “healthy” marketing of these beverages is horseshit. I read that quote and my eyeballs almost fell out of my head. Are you furious yet? I am. Let’s fix it. I get it. Sugar is awesome. It’s delicious and makes us happy…temporarily. It also makes us fat. And holy **** is it addicting. It targets the pleasure centers in our brains, and is more available now than it has ever been in the history of our species. Unfortunately, our lizard brains have not adapted to its widespread availability instead of scarcity, which means our bodies can’t say “no” or “just a little.” This means we can ACTUALLY get hooked on the stuff. There are even studies that claim sugar can be as addicting as cocaine. So the solution is simple: do more cocaine, less sugar! Hahahaha, kidding. I’m not a doctor, and I don’t currently have pants on as I type this, but my advice would be to probably avoid both sugar and cocaine as much as possible. Unfortunately, avoiding sugar is more than just giving up soda (though that’s a DAMN good start!). Other problems arise because sugar is in EVERYTHING and often hidden. Why can’t we just tell the truth, people? We talk a lot about a nefarious shadow organization making us fatter and lazier in our monthly story-driven adventure, Rising Heroes. It’s like there really is a conglomeration of bad guys aiming to make us unhealthy. 1) Whenever possible, minimize liquid calories. 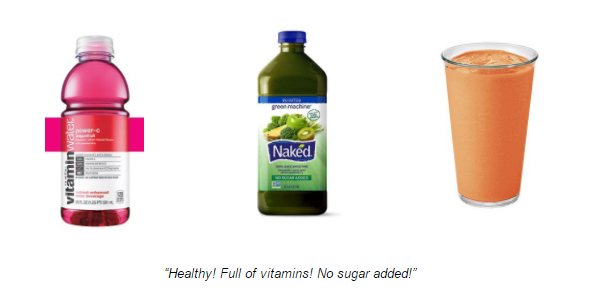 This includes frappucinos and sodas, but also “real fruit smoothies” and “healthy” Naked Juice drinks, Gatorade, and even things like apple juice, orange juice, grape juice, cranberry juice, etc. Every once in a while? Sure. Just make it a rare treat (“treat yo’ self!”) – you’ll actually enjoy it more and be healthier! I personally prescribe to the “out of sight, out of mind” philosophy because I have the willpower and restraint of a 5-year kid in a candy store. I don’t keep sugary beverages in my house so I’m not tempted and have to waste willpower trying not to drink them. I’ve found that drinking sparkling water like LaCroix can really help me THINK I’m drinking soda, and provide me with the same level of happiness and fizzy satisfaction – without the sugar. To answer your next question: here’s a whole article on “Is Diet Soda bad for me?” High five! 2) Don’t trust the front of the label, and learn to recognize sugar’s aliases. A label is required to list ingredients by amount, so by adding multiple types of sugar with weird names, a company can get away with moving sugar down the list. Look for the following names: Agave nectar, Brown sugar, Cane crystals, Cane sugar, Corn sweetener, Corn syrup, Crystalline fructose, Dextrose, Evaporated cane juice, Organic evaporated cane juice, Fructose, Fruit juice concentrate, Glucose, High-fructose corn syrup, Honey, Invert sugar, Lactose, Maltose, Malt syrup, Molasses, Raw sugar, Sucrose, Sugar Syrup. If you only look at two numbers on the back of a box, look at grams of sugar and total calories. You want minimal sugar and fewer calories. Don’t let perfect be the enemy of good. Do the best you can! Oh, and if a product says “no sugar added” on the front of it, you can bet your life savings on it having a RIDICULOUS amount of sugar. Note: please don’t bet your life savings on this. 3) Be skeptical, because sugar is in practically everything. When in doubt, eat things with fewer ingredients. We consume 130 pounds of sugar per year on average (holy crap), which means the white stuff in in way more foods than we realize. Not just candy and soda, but practically everything. Nature Valley Granola Bars? Plenty of sugar. In fact, most “protein bars” have tons of sugar. And, until outraged customers complained, “Nature Valley” Granola Bars were made with high fructose corn syrup. Mmmm, nature. Pasta sauce? Should just be tomatoes right? Nope. Add in heaping tablespoons of high fructose corn syrup too and you’re getting closer. Wheat bread? That’s gotta be healthy, right? Check the ingredients. I bet one of the top 5 is “high fructose corn syrup” too. Hell, look at what’s advertised as a “balanced breakfast” these days on TV! Cereal and skim milk, fruit, a glass of orange juice, and toast. Or, in other words: sugar and sugar water, sugar, sugar water, and pile-o-carbs. 4) Track your sugar intake, and minimize it over time. As I cover in “Star Wars Explains Why We’re Fat,” everybody has a different amount of “gimme gimme gimme” in our brains that craves instant gratification. This means we all have different abilities to get addicted to things, including sugar. Some people can eat sugar (or have one drink, or try drugs) and not get hooked, while others struggle with addiction instantly – once is enough to get hooked for life. This comic explains human behavior and addiction quite well…with dinosaurs. If you are somebody who is actually hooked on sugar, start by tracking your sugar intake each day (actually look up the sugar content of everything you consume! ), and see how many grams you’re eating every day. Don’t worry about total numbers, just focus on eating less sugar than the day before. Repeat. Michael Pollan, author of the Omnivore’s Dilemma said it succinctly: “Eat food, not too much, mostly plants.” Eat real food (meat, vegetables, unprocessed stuff), keep your calorie total down, and stick to mostly plants along with healthy protein. Done! We’ll continue digging into this battle against Big Sugar, shadow organizations, and false advertising in future posts. It’s amazing how heavily the deck is stacked against us when we try to be healthy, and how tough it is to find the actual truth! I have no problem with sugar and people making choices that don’t line up with their health goals occasionally. What really grinds my gears is when sugar is snuck into products and falsely marketed as healthy. We’re going to fight, and it starts by educating ourselves on how much sugar we’re actually eating. Over the next week, your mission is to read the labels on the food and beverages you’re consuming. Specifically keep an eye on how many grams of sugar you’re consuming. Then over the next few weeks, try to drop that amount down by 10% each week. And then let me know how you did! I want to hear from you: did you find this post useful? Hit reply and let me know if this article is actually gonna help you start to remove more sugar from your life! PS: We’ve recently overhauled our monthly story-driven experience, Rising Heroes. We’ll be opening doors for it next Monday, a few weeks later than normal – if you were waiting to get in, sorry for the delay. 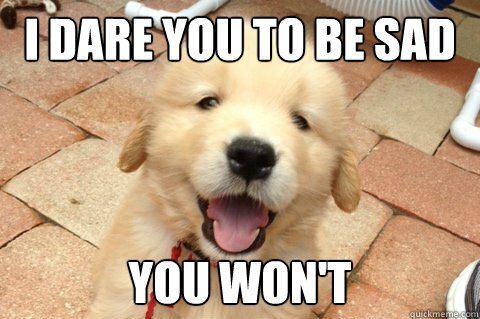 I promise it’ll be worth it – we’ve unrolled some big updates! ? PPS:If you want to learn about the history of sugar and a contrarian viewpoint to “calories in, calories out no matter what they are,” check out Taube’s book “The Case Against Sugar.” It’s thought provoking and entertaining.